I couldn’t take a beautiful photo of the Executive Nexus laser in black due to limited photography skill, so this is the photo of Executive Fusion, a class higher of same design from the Wicked Lasers website. Although I have hold on the Wicked Lasers Executive Nexus laser for roughly 2 months, actually I have a hard time figure out what to do with and how to use such a powerful laser in daily life. However, this laser (laser pointer if you like) is meant to be ‘liked’, and probably only very small percentage of people will ever truly need it in their jobs or life. It can be proved from that fact that the more I played with the laser, the more I like it, and the more amazed were my friends. Most likely, if you ever buy one (they have may models, not just the one I received) from Wicked Lasers, probably it’s due to your hobby on lasers or for one of the fun features that attributed to power lasers which will be elaborated below. 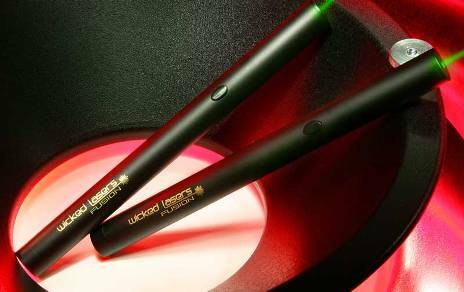 The Nexus laser of Executive series from Wicked Lasers has rated output power of 95 mW. For comparison, the presentation laser used in classroom or during demonstration, which usually in red color, has output power of only around 1 mW, and almost all of them at most less than 5 mW. So this wicked Nexus is at least 50 times more powerful than typical consumer laser, and that’s also where the interesting features lie. It’s dubbed ‘green’ laser primarily because of the laser beam color at wavelength 532 nm is green, but why green laser is not widely used in normal standard consumer laser pointer also explain the higher costs and much complicated process to generate the laser. More on Wikipedia. So as the laser is unlikely to use in daily life, what’s the need to buy it or what’s the application of the laser after you buy it? How about amaze your friends with this unique laser. The laser beam range can supposedly points to object more than 50 miles away. In my test, the laser beam clearly visible on a building wall about 2 km away, both at night and during daytime, and best of all, the laser point is still in single spot dot without beam divergence. The wicked laser is definitely better than spotlight or high powered torchlight to precision pointing. The extreme length of laser is more jaw-dropping when pointing to the sky. The green laser looks like trying to reach the stars when pointing at them, and can be clearly seen! So I believe the Nexus laser (or probably less powerful one will do) is the good toy for astronomy lover for stargazing or helping others to pinpoint and identify objects in sky accurately. I used to join Sounds of Silence under-the-star dining at Ayers Rock (Uluru), Australia, where star talk and stargazing was part of the program. The astronomer held a bulky and big torchlight with diameter not less than 10 cm. Yet, the light beam is much wider and the range appeared much limited even though it’s a clear (and beautiful) and moonless southern sky. Other possibilities and functions that can be done with the laser, according to Wicked Lasers, includes make holes in black trash bags (I did it in gray colored bag in about 15 seconds), open-cut healing power if advised by physician, daytime smoke detection, sting bare skin, burn dark fabrics, pop dark colored balloons, ignite wooden or paper matches, cut black electrical tape, etch dark plastics and leathers, light fireworks and melt rubber and plastics. If you opt for Fusion with 125 mW power, you will have 100 miles laser range, and can light cigars and cigarettes too. With such powerful laser beam, you probably can use it in the war zone to scare off enemies too. One thing unbelievable considering the power of the laser is that Nexus is power only by 2 AAA batteries. In my normal usage, the battery can lasts about slightly below 2 hours (90 minutes officially). There are many more products such as military grade Spyder II GX and Photonic Disruptor, and Sonar Series and Spyder II BX of blue laser nature, and Pulsar series of red laser nature. If you looking for a really cheap laser pointer, the CORE 5mW consumer level green pointer which guarantees 5mW output power (hence more safety) costs just $49.99. If you do buy one, be extra careful of laser safety. Any accidental beam into eyes may damage retina and cause lose of sight disability. 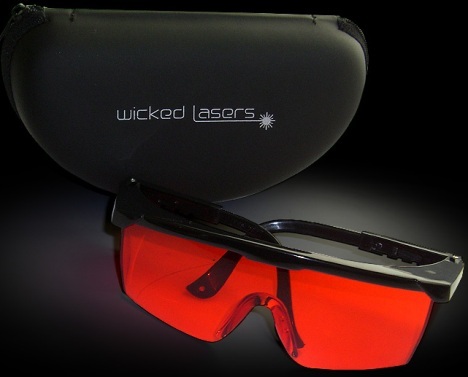 My review set also comes with a Green 532nm LaserShades laser googles protective eyeware which designs to block green laser wavelength range to protect the eyes from the reflected or scattered laser light with a hazardous beam power, as well as from direct exposure to a laser beam. You probably need to add this $39.99 accessory to your purchase list as it normally does not come with laser purchased. For me, I become loving this ‘wicked’ gadget the more days I hold onto it, but probably the Nexus will still most likely lying idle in the drawer for foreseeable future, except when I want to make my friends drop their jaw by showing the magic of this laser.